When you are in a car accident, it is not the time to be trying to think of all the things you should do. No matter whether it is a serious accident or a tiny fender-bender, chances are that you are shaken up and not quite thinking clearly. This is why it is important to consider some general auto accident dos and don'ts long before you need them and to carry a list of these items in your vehicle for when you do. -Get medical help for anyone who needs it before taking any other steps. This includes yourself. For people who aren't sure if they need assistance choose to be safe rather than sorry and call an ambulance. -Call the police if the situation warrants it. The police may only respond to injury accidents in some areas while in others they will come to any accident when someone calls. Having a police report to document the situation can be a great help later on. -Exchange information with the other driver. This should include the vehicle's license plate, driver's name and phone number, insurance information and address. Additional helpful information can include the make, model and year of the car and the driver's license number of the person who was behind the wheel. -Get information such as name, telephone number and address from any witnesses at the scene. Note that while you may want to get their information as well, passengers in any vehicle involved in the accident are not witnesses. -Photograph and/or document the scene. Keeping a disposable camera in the glove box can be helpful for this purpose. However, a sheet of paper and a pen or pencil can be used to document the various vehicle and structure positions in a pinch. -Collect and keep any evidence relevant to the accident. This could include evidence of injury such as bloody clothing or evidence of what caused the accident such as road debris. -Contact your auto insurance company as soon as possible. Contact your health and homeowner's insurance as well. -Call an experienced car accident attorney. -Leave the scene of the accident. At best this doesn't look good; at worst it is a crime. If the police came out do not leave until they tell you it is okay. -Move your car unless required for safety or legal reasons. Cooperate with the police or other emergency personnel if they ask you to do so, however. -Remain in the area if the area is not safe. If staying with your car could subject you to further injury get out of the vehicle and move to a sidewalk or other safe area. -Admit guilt, apologize or discuss fault with anyone. This can be used as evidence against you at a later date. -Accept any settlements or make any statements to insurance companies other than yours without talking to your attorney first. -Wait to contact your attorney. The earlier you get legal aid the easier it will be for them to make a good case. At Zinda Law Group PLLC we are committed to doing whatever it takes to make sure you are fairly compensated for your injuries. We work hard to help you recover every loss associated with the car accident. If you think you have an accident or injury claim, we urge you to contact our office. You can receive a no-cost, no obligation consultation to discuss your case with one of our attorneys. 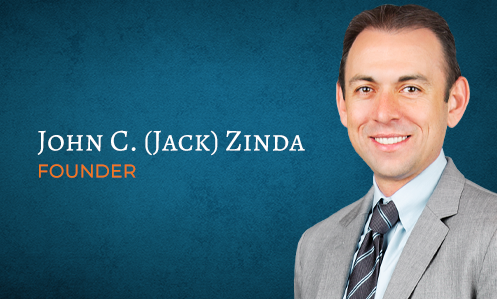 At Zinda Law Group PLLC, we are committed to providing every client with one-on-one attention and dedicated service. Call us today.